U.S. officials hope the investments, announced Friday, will speed up the county's move to next-generation 5G mobile service, potentially offering speeds of 10Gbps, and allow for a rapid expansion of the internet of things. 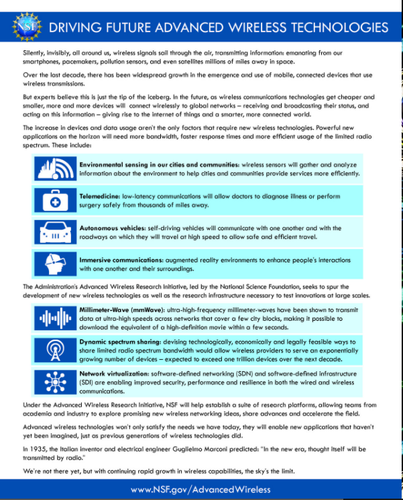 The next-generation mobile services will enable self-driving cars, an "always on" IoT, smart cities, new virtual reality offerings, and video to aid police, firefighters, and emergency medical responders, said John Holdren assistant to President Barack Obama for science and technology. "Time and again, history has shown us that when we make sustained federal investments in fundamental academic research and in public-private partnerships ... we as a nation reap the benefits," Holdren said at an NSF event in Washinton, D.C., Friday. Friday's announcement piggybacks on a Federal Communications Commission vote Thursday to open up nearly 11 gigahertz of high-band spectrum to 5G and IoT services. "After making the spectrum available, we're going to get out of the way of the technology," he said. "We want to turn innovation loose."